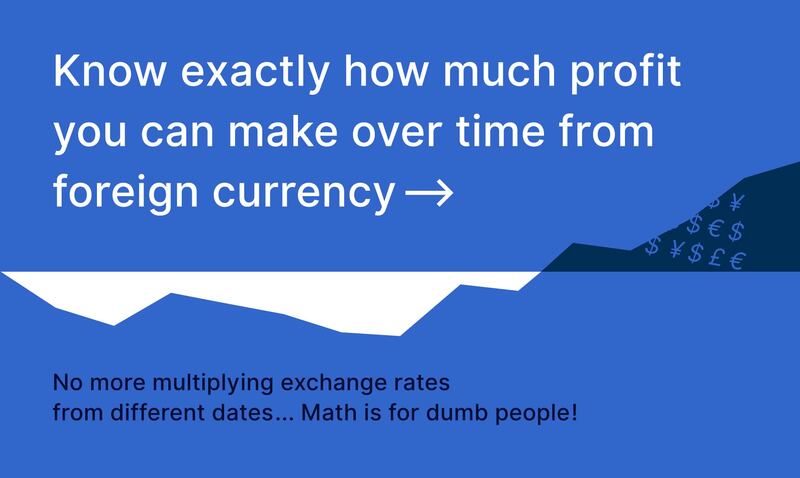 Most currency converters available out there give only the exchange rate between currencies and the converted total. 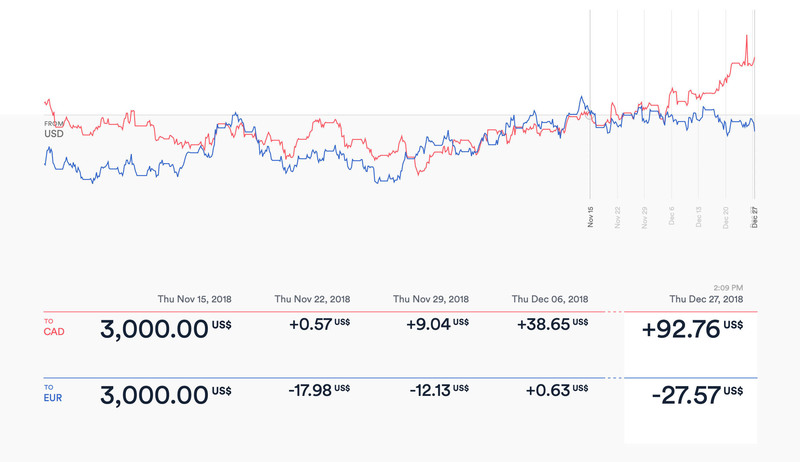 To bridge a gap and cut some extra calculations, I made this simple-to-use tool that also reveals the profit or loss made over time since the original amount was acquired. 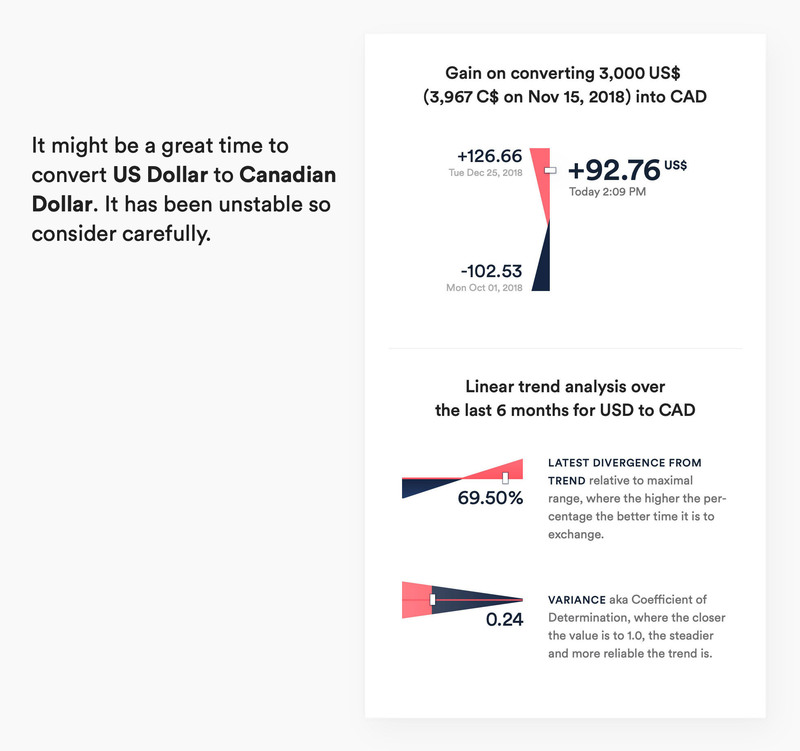 This helps users know whether it is a good time to convert foreign currency that they already own or intend to acquire, and they can compare with other currencies as well. 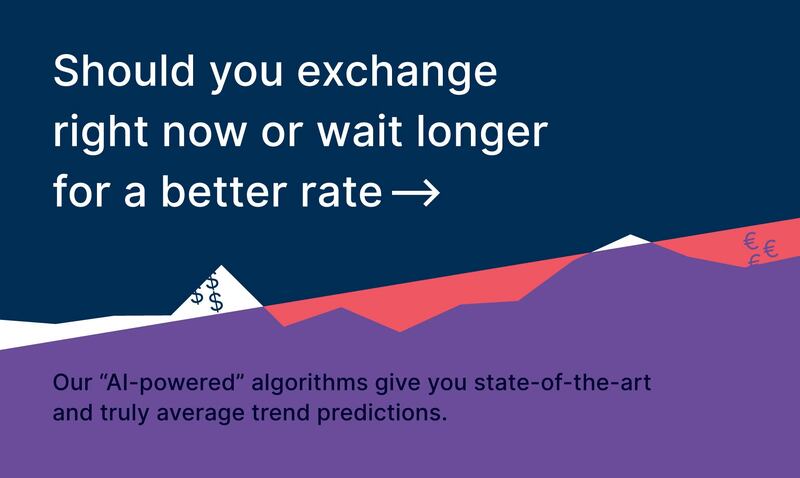 With suggestions based on exchange rate trends, it becomes easier to choose between exchanging currency right away to make a profit or wait longer for more advantageous rates. I started this project as a solution to one of my own personal needs and also as a learning platform. When receiving payments in different currencies, I can choose to keep the money in check until the exchange rate to my home currency becomes more profitable. All the tools I found required some degree of fiddling and calculating every time to know how much I can actually gain—I needed something more straightforward without getting into the professional trading rabbit hole. Let me start by saying that this tool is not ideal for people who simply want to know what an amount in a particular currency converts to at that specific moment. It is more straightforward to use one of the countless other converters made for that. I would also omit professional traders as there are existing advanced tools catered to them. Currency watchers who have money saved in various currencies and want to know how much their converted value has changed over time, and/or are waiting for an opportune moment to convert into another currency. Travellers, with enough latitude, can work out the best time to exchange money before and after their trips. They can effectively lose as little as possible on conversion, or gain from it and save some money. The first thing that comes to mind when someone wants to convert foreign currency back is usually “How much money did I make since I initially obtained it? 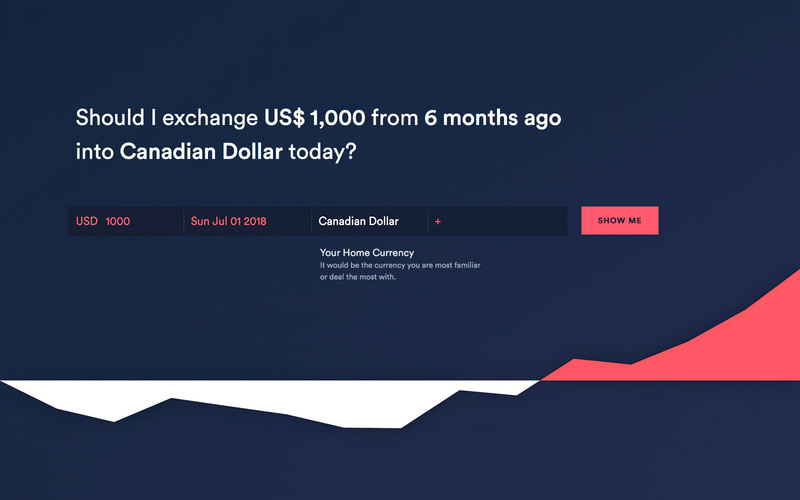 Or did I actually lose some?” … The main purpose of this tool is to answer these questions in one step—while most available tools give only the current exchange rate or the simple conversion of an amount, shouldiexchangenow.com takes it further. The contemplated outcome is the value gained (or lost) as a result of conversion since the original amount was obtained. This profit or loss, accompanied by a maximum and a minimum value attained within the time span, gives a clearer insight into whether it is advantageous to exchange at that particular moment … Is the exchange value peaking or close to, and therefore worth jumping in immediately? Or lower than what it was worth originally? If it is the latter, it might be better to wait until the exchange rate (hopefully) rises back again. 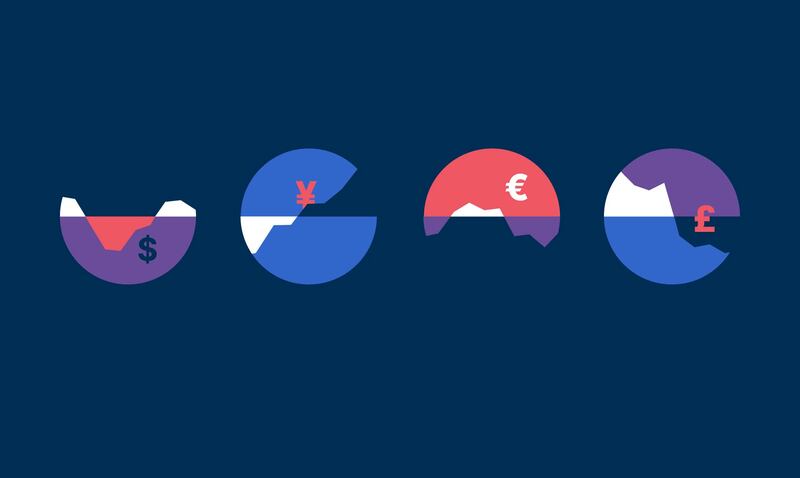 Because dealing with many different currencies can easily become confusing, all resulting values are translated to—and put in the context of—the user’s Home Currency. It is the one that they are most familiar with, usually being the currency used where they live, and this allows for a better comprehension of all the results. Other required inputs are the Currency & Amount that the user wants to exchange and finally the Origin Date, which is the time when the money was originally acquired or converted. Additionally, other Foreign Currencies can be added as conversions either for comparison or if the Currency to be converted is the same as the Home Currency. Plotting a graph of the Percentage Change in Converted Values over Time rather than the more commonly found graph of Exchange Rates over Time offers a more insightful comparison between currencies. 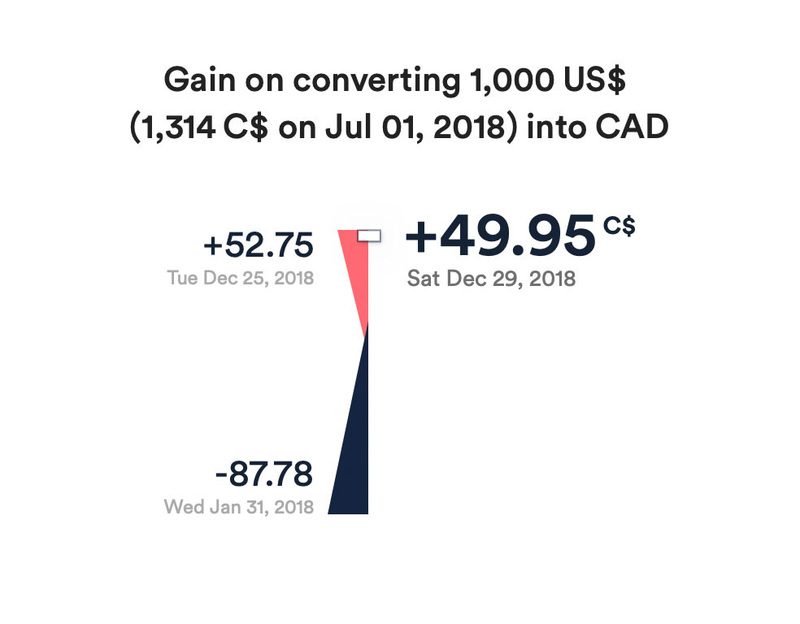 To demonstrate this, let’s use an example with real historical data by converting US$ 3,000 to both Canadian Dollars and Euros over a period of 6 weeks. 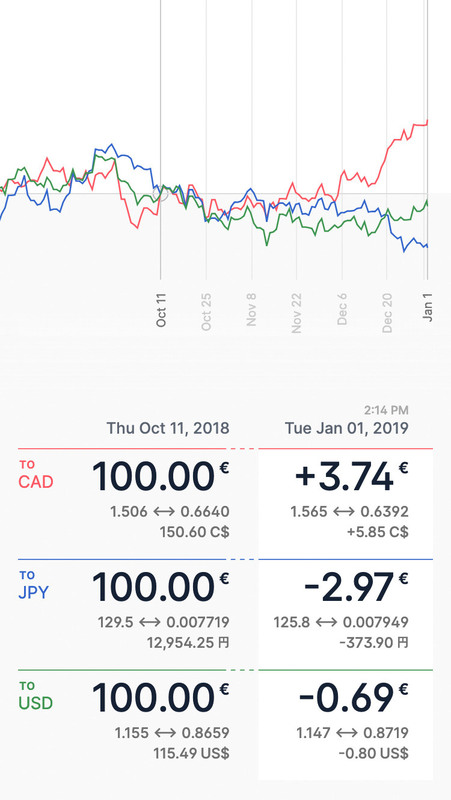 With the resulting chart and table below, we can see that it would have been much more profitable to convert to Canadian Dollars than to Euros. The slope of the graph shows how it reached that point, and the track history before the Origin Date gives a better idea of the past trends and possibilities when extrapolating for the future. 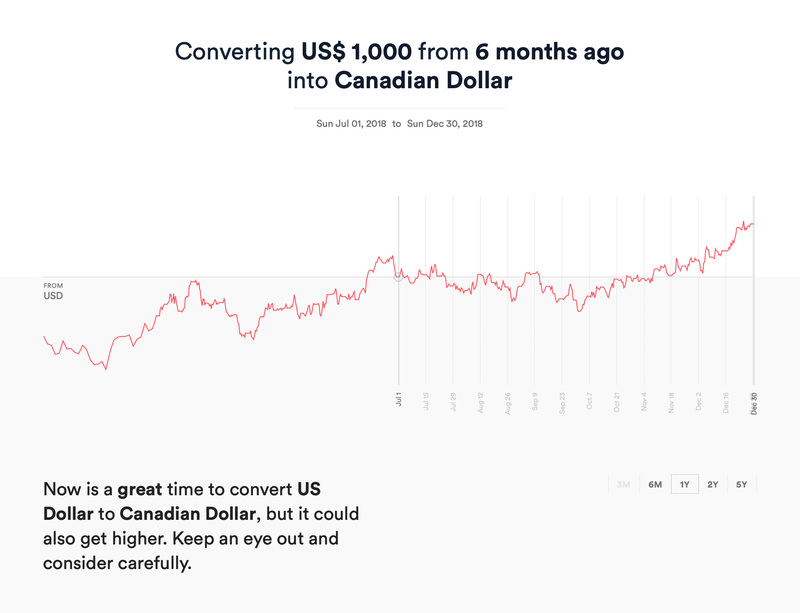 When comparing to other existing currency tools and websites available online, the most common type of charts will present the conversions’ Exchange Rates over Time. 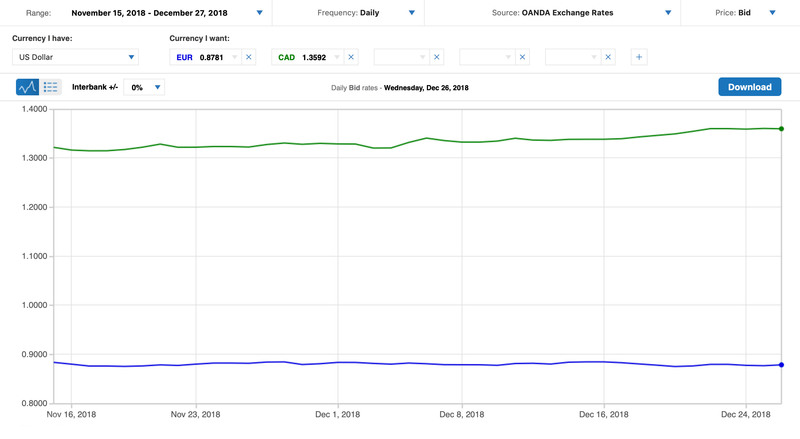 For example, using the same USD conversion to CAD and EUR on oanda.com, we can see how different the first chart below is from the one above, even if they both share the same inputs. The spikes and drops are barely distinguishable and it is quasi-impossible to make any comparison between the conversions when the lines are so far apart. 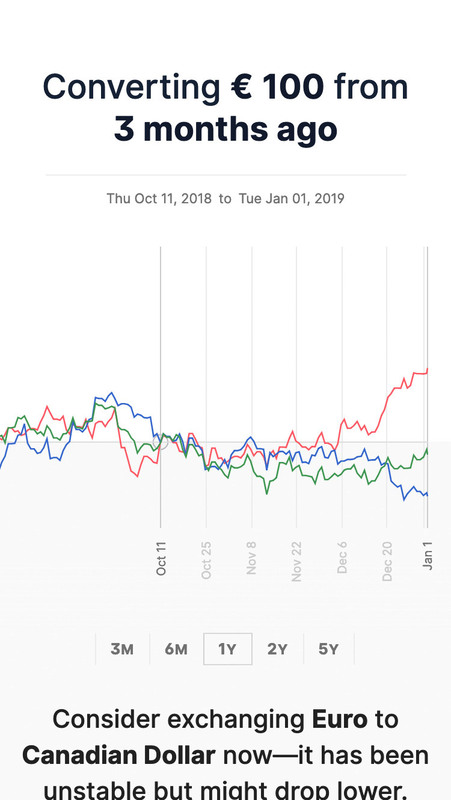 The difference between exchange rates can vary considerably, and other than the minimal slope and relative gap, the chart doesn’t give any significant information with regards to the difference in fluctuations between those conversions. 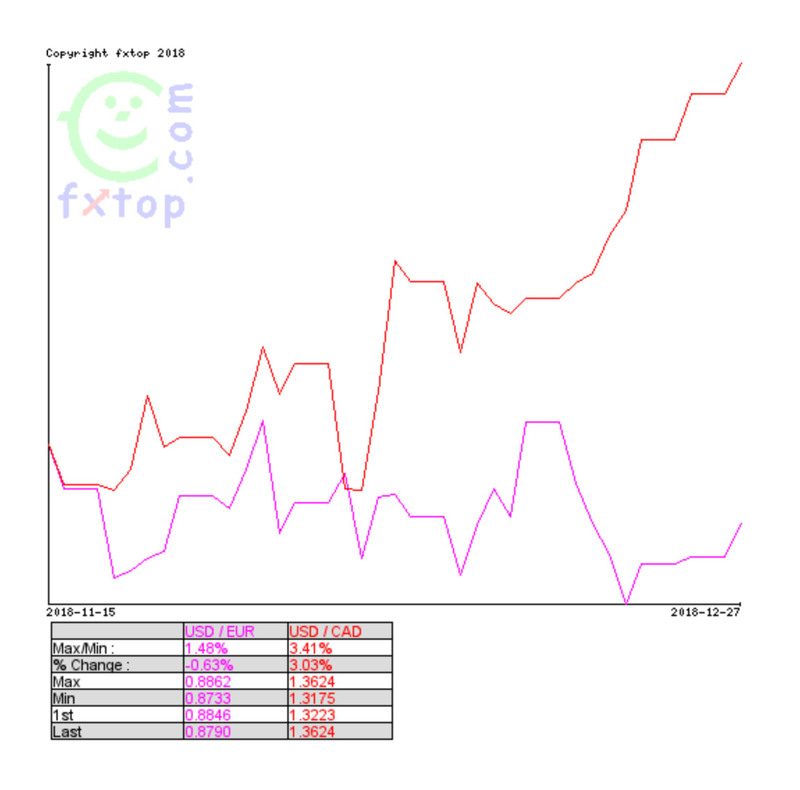 The second example, from fxtop.com, is one of the rare websites where I found a comparison of Percentage Change in Exchange Rates over Time. But even after glossing over the questionable interface and usability, it left a lot to be desired—for the most part, it didn’t cater to what I was looking for, i.e. to eliminate extra calculations. Since the results in the table are percentages, I still had to do some additional multiplications to obtain my actual currency gains in relatable numbers. With the historical graphs dynamically plotted and the nature of the progressions accessible, it became possible to provide a basic but handy prediction system. Using an average for each conversion over the current time span as a linear trendline, we can obtain a particular point’s divergence from that trendline and its variance, aka coefficient of determination or R² (this tells how predictable the trend is based on the individual points). With this information, the data can be translated into words. The further away the selected point (in this case the current date) is from the trendline, the more or less profitable it is, and as such, recommended as a better or worse time to exchange. The higher the coefficient of determination, meaning the steadier and closer the graph follows the trendline, the more reliable that recommendation is. While not being a perfect prediction system, it is basic enough to get a general sense and give an idea of what can happen in the immediate future. There are of course other more comprehensive methods that exist, where mathematical cues are only a part of the equation and economic, political & social factors play a much bigger role. Notwithstanding the fact that this is a whole profession and expertise in and of itself, I purposefully kept it simple and basic enough for a more untrained audience. When choosing to wait for better rates in the future, there needs to be a way to come back to that particular currency conversion later on to see its progression, but not have to input the info all over again. In lieu of a full-fledged feature that would involve user accounts and saved preferences (in an uncertain future release perhaps maybe? ), I made it so that any particular conversion can be accessed directly via URLs with parameters. Using this, anybody can simply copy the URL from the address bar to save it for later, or share it with other people. I also made a mini-tool that essentially generates a URL with the chosen parameters. By selecting and changing the options to get the desired conversion, the URL is updated accordingly and can be copied to the clipboard to be shared. Pretty basic but handy for people who may not know how URL parameters can be used. I also avoided shortening the URL so that the parameters are more readable and easier to change on the fly. I started this project as a single barebones webpage with only the essential requirements for my own use. Realizing it might be useful to other people in similar situations, I decided it was a good enough premise to build a more usable product aimed at a niche set of users, and serve as a portfolio piece at the same time. There were so many head-scratching mathematical problems to solve in the process but I eventually managed to write algorithms that give the contextual results I wanted depending on the attributes selected. 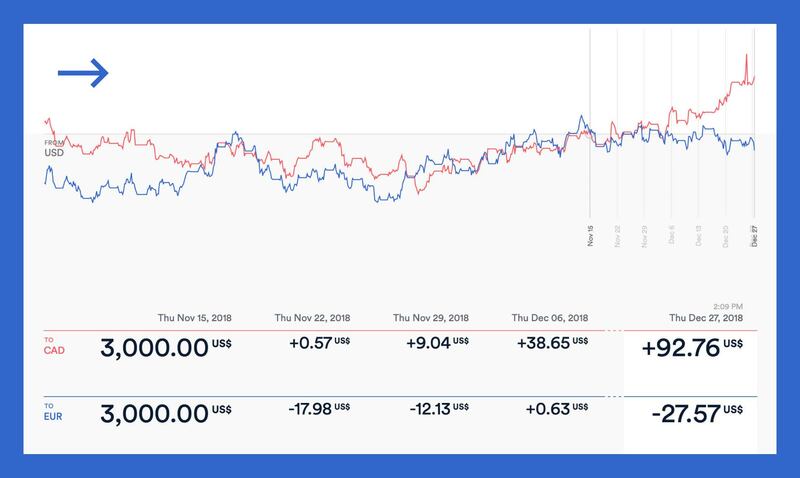 Historical data is fetched from CurrencyLayer API, where the exchange rates gathered before I started collecting data dynamically have a daily frequency. Most of the data after that is fetched and updated on the website every hour but stored only every 4 hours, giving 6 data points per day for anything before the current last hour, which is more than enough for the purposes of this app. The website was designed to be used on larger screens at first, but I later adapted it to be responsive and accessible on mobile devices as well. As expected, there were more than a few challenges involved. Ideally, it had to work in a familiar way without using different libraries for the chart and table. I managed to do that by placing them in a horizontally scrollable container while still keeping the focus on the important part of the data when the page loads. For the typeface, I was originally using Circular by Lineto but finally opted for Inter by Rasmus Andersson. 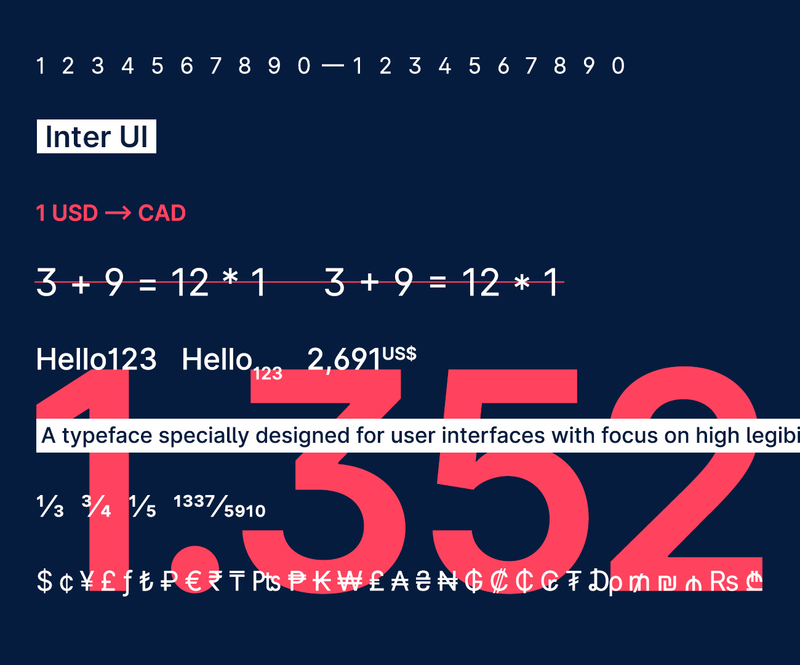 Designed especially for user interfaces, it is a very utilitarian typeface that works well with the data-driven aspect of this tool. A big advantage (other than being free and open source!) is the completeness of the family with all of its OpenType features accessible through CSS. Contextual and case alternates adapt to the text, with for instance mathematical symbols that align better to numbers and capital letters. The numbers can be switched to alternate digits that provide better legibility, such as the 3/8 and 6/9. Tabular numbers are also available, but I opted for readability rather than comparability in this particular case, given that the numbers were large enough to be easily differentiable, and would introduce noticeable gaps when they are set as tabular. User Accounts and Saved Parameters—Giving the option to create an account opens the door to advantages that would cater to the user’s preferences and allow user-specific features, including some of the ones outlined below. One main feature would be the ability to save a number of currency conversions with different parameters so the user can log in and access them anytime. 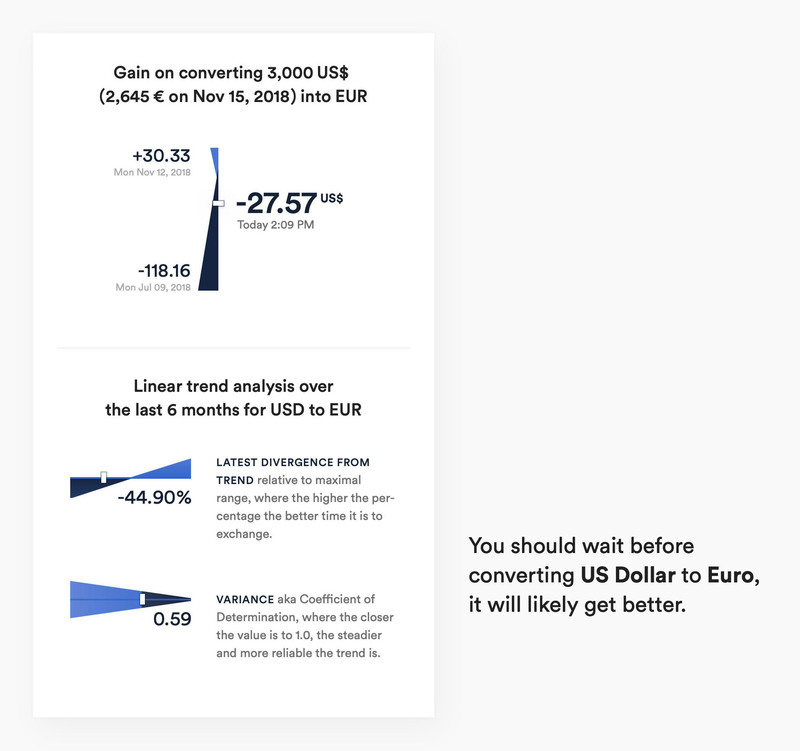 Alerts and Notifications—An email can be sent to notify the user when a particular currency conversion has reached a specified high or low threshold, so they don’t have to check the rates and progressions all the time. Conversion Fees Offset—While the results on the website are based on mid-market rates, the actual resulting sum when converting will be lower in most cases. Exchange rates are usually manipulated and conversion fees charged by banks and currency brokers. Adding an option to apply either a specified percentage fee or a fixed amount fee (or both) would offset the results and present a more realistic assessment. More Interactive and Flexible Chart—Other than the tooltip that appears when hovering on a point, the chart is currently somewhat static. This can be improved in many ways—for instance, allowing the user to zoom in on a particular section or zoom out further away in the past without having to reload the page. It would also be beneficial to allow having several currency conversion pairs with different parameters (including different Origin Dates) on the same timeline. 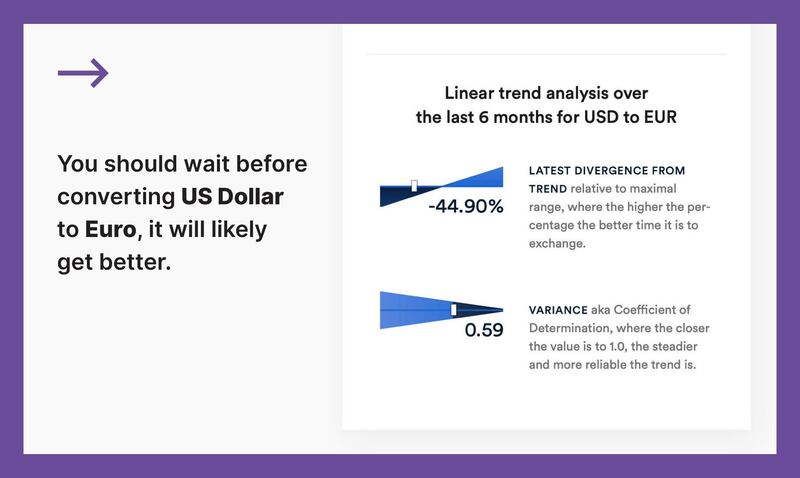 Better Predictions—While there is no guaranteed way to predict the movements of a particular currency, graphs can incorporate more complex and ostensibly reliable non-linear trend forecasts. Etcetera—There are a lot more areas that can be improved as I gathered during and after development, like in any other product cycle. But hey, gotta know when to call it a day.